4 Bedroom House For Sale in Penzance for Guide Price £750,000. This is a beautifully presented four bedroom family home with two additional annexes on approximately 3.5 acres of grounds set in a wonderful private rural location yet only 2 miles from the sandy beach of Praa Sands. The current vendors have been very successfully letting the annexes in recent years both on a full residential basis and also as a holiday let with all properties having a balanced layout with private areas for the main house and each of the annexes. The property is perched nicely in an elevated position with wonderful views over the valley to the distant fields with wonderful gardens and grounds, numerous outbuildings, a static caravan and copious parking for all three properties and guests. The main house itself has a seamless transition from the original house through to the modern kitchen extension which has a vaulted ceiling creating a feeling of a bright and airy space. Fitted with a range of wall and floor mounted units the kitchen looks out onto the formal gardens and has some of the property's best views over the valley. There are two reception rooms on split levels with a brilliant and traditional wood burning stove that is the basis for heating these two sizable areas. The living room itself has been cleverly sectioned off at one end to create an ideal office or study space. There are four bedrooms in the main house of which the master bedroom has the benefit of en-suite bathroom facilities. There are two bedroom on the first floor which, like the master bedroom take full advantage of the far reaching views over the valley. The guest bedroom is in an ideal place away from the other bedrooms which provides a good degree of privacy from the rest of the house. Attached to the side of the main house is a delightful two bedroom annexe which has been successfully let on a long term basis for the past few years to very reliable tenants. The entrance porch leads into a light and bright open plan area with the focal point of the sitting room being the contemporary wood burning stove. Through a wide opening is a practical kitchen/dining room which is perfect for a couple or young family. The annexe has its own private garden which is a delight to sit out and enjoy the view while enjoying some alfresco dining. Further accommodation is Little Crofty which is a bijou one bedroom property which has been finished to a high standard. The vendors have holiday let this successfully in recent times with this popular rural retreat having private outdoor space away from both the main house and annexe. The vendors have a static caravan in the top corner of the plot which they use as overflow accommodation for guests. Externally the property is in a very quiet rural position with no near neighbours and has a two tier level garden that wraps around the kitchen therefore perfect to watch the children playing. There are numerous sheds and outdoor storage areas for larger items like bikes and kayaks as well as gardening tools and machinery. Plenty of parking exists for all three properties and guests. There is a single garage and further double carport for covered car parking. In all the land extends to approx. 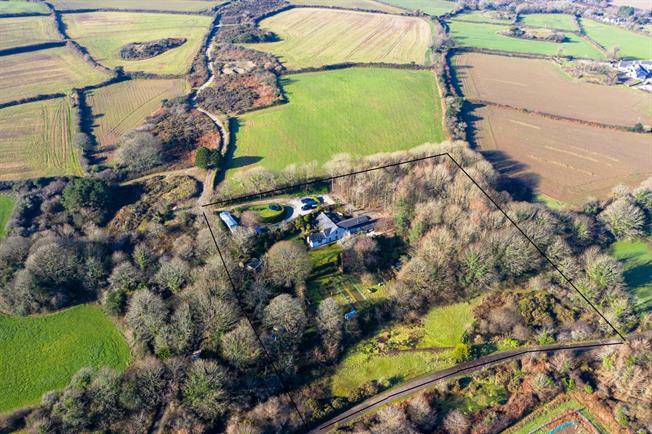 3.5 acres which is made up of the formal gardens around the property which are mainly laid to lawn and bordered by mature trees and shrubs, a lower small paddock and a lovely piece of woodland to the side of the property. This rural retreat is the perfect property for those looking for a private location with distant rural views, no near neighbours, an income generating property and within a couple of miles of the coast. Set in a rural position with stunning views this property has no near neighbours and yet is a short distance from the the West Coast with footpaths that lead along the coast to other coves and beaches such as Perranuthnoe to the west and Praa Sands to the east. The nearby small villages of Rosudgeon and Goldsithney both have convenience stores, post offices and award-winning pubs with the Falmouth Packet Inn within walking distance. A short drive away is Marazion and Porthleven which have a popular selection of beaches, pubs and restaurants. A short drive from the property, the A394 can take you to either Helston or Penzance, both having a large variety of shops, schools, supermarkets and amenities. The following services are available Mains electricity, private water supply, private drainage, oil central heating in the main house, electric heating in the annexe and Little Crofty. A telephone line although we have not verified connection.